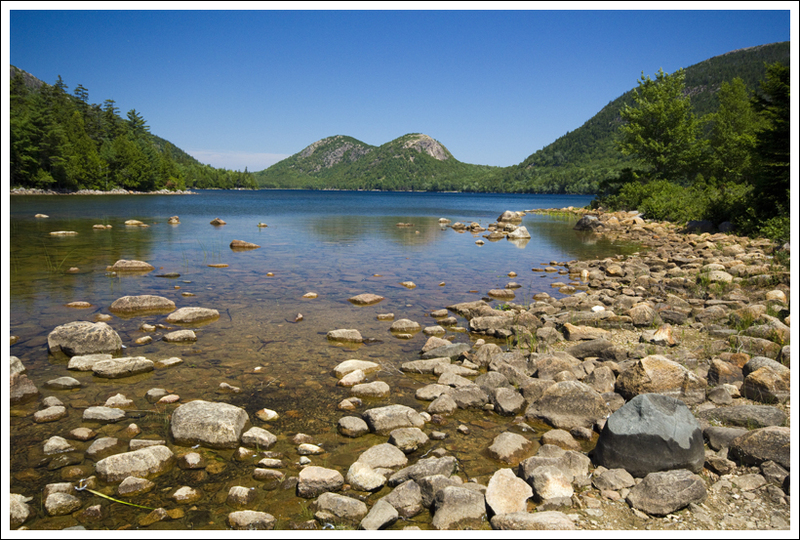 The bike ride along this loop gives you beautiful lakeside views in the interior of Acadia National Park. A view of Eagle Lake from the Carriage Roads. Below: The Duck Brook Bridge entrance to the Carriage Roads; There are lots of water lilies in Acadia’s ponds; Adam bikes along the shore of Jordan Pond. The rocks lining the trail are affectionately known as ‘Rockefeller’s Teeth’. This is truly one of our favorite places to bike! If you are ever near Acadia, I would recommend taking a bike ride around Eagle Lake. 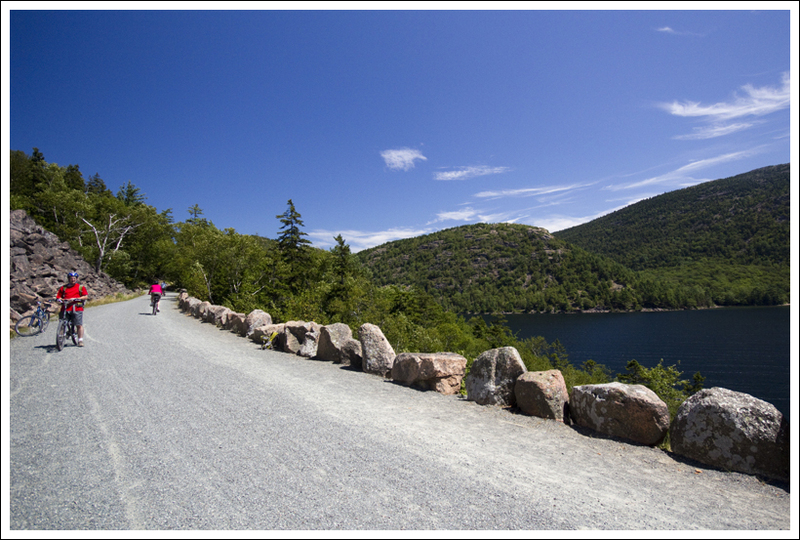 While there are 45 miles of carriage roads in Acadia National Park, the loop around Eagle Lake is by far the most popular. 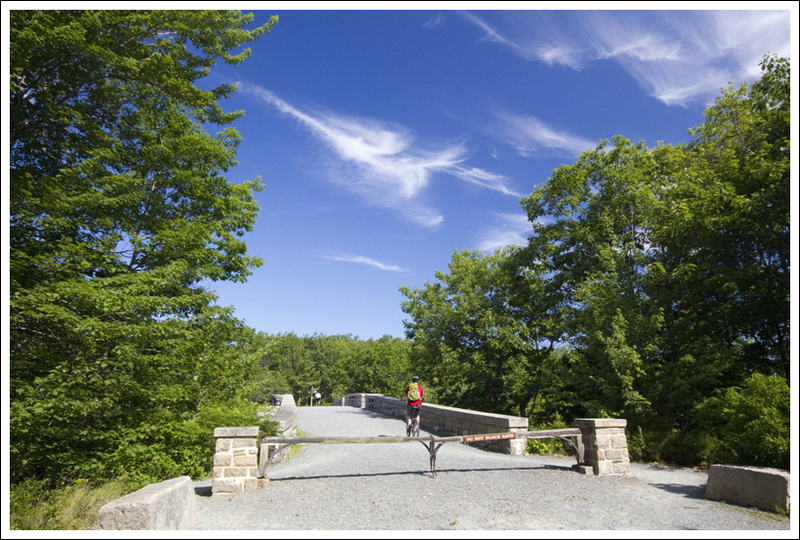 The carriage roads were donated and built by John D. Rockefeller, Jr., emulating the carriage roads his father created in Ohio and New York. While the Park Loop Road provides access to much of the circumference of Acadia National Park and ocean views, the carriage roads provide great access to the interior, providing glimpses from the top of mountains and around the lakes and ponds. I recently had a co-worker, Kristen, that was going to Maine to visit some family property. Having been to Acadia many times, I planned out an ambitious day for her and her sister to capture the things I enjoy up here. She wasn’t able to do everything I suggested, but she did the Eagle Lake/Jordan Pond section of the trail. 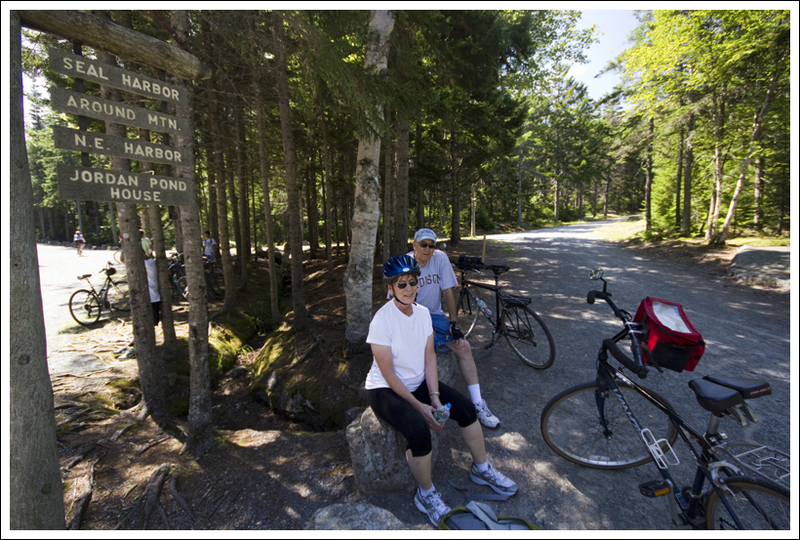 They rented bikes in Bar Harbor and decided to bike from town to reach the carriage roads. There is a large hill from Bar Harbor to reach the entrance to the Eagle Lake parking lot. Her sister was yelling up ahead to her, “KRISTEN! I DON’T THINK I CAN MAKE IT!” I should have been explicit in telling her to rent a bike rack and park near the carriage road entrance. Some people bike to the carriage roads from town, but I think it is best to park closer or you’ll burn up all your energy before you get to enjoy the actual ride. Adam on his rented comfort bike, passing under the Eagle Lake bridge. It was quite different from the mountain bike he normally rides. Below: Christine’s parents take a break after a long uphill stretch along Eagle Lake. This is the spot we took a wrong turn! We started our ride, by parking on Duck Brook Road. Right before the roadside parking, you pass a beaver dam on New Mill Meadow. Park your vehicle near the bridge that begins your journey. The carriage road intersections are all numbered on wooden posts (that also serve as posts to provide you some overall direction) and have this trail started at Post #5. We took a right after crossing the bridge to make our way around Witch Hole Pond. The trail does tend to go uphill during this part of the section about 100 feet. In 1.1 miles you will take a left at Post #3. 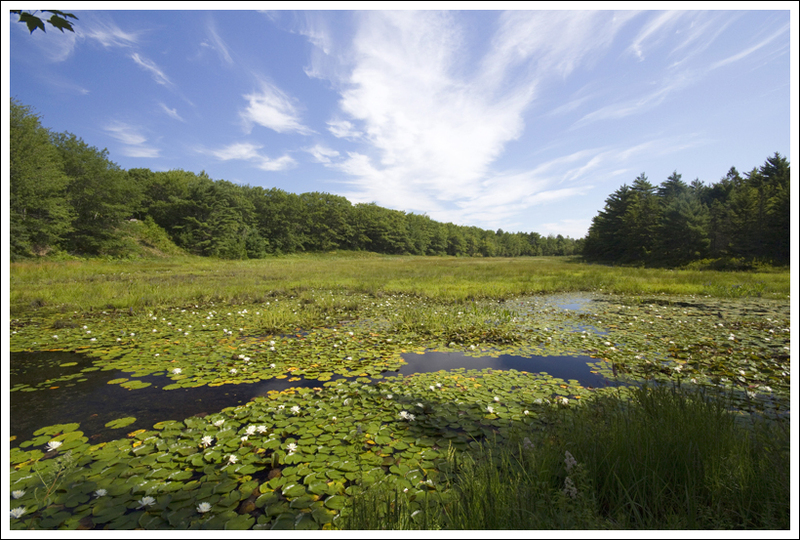 You will begin to see some up close views of Witch Hole Pond. At 1.3 miles, you take a left at Post #2. The trail continues to loop around Witch Hole Pond. 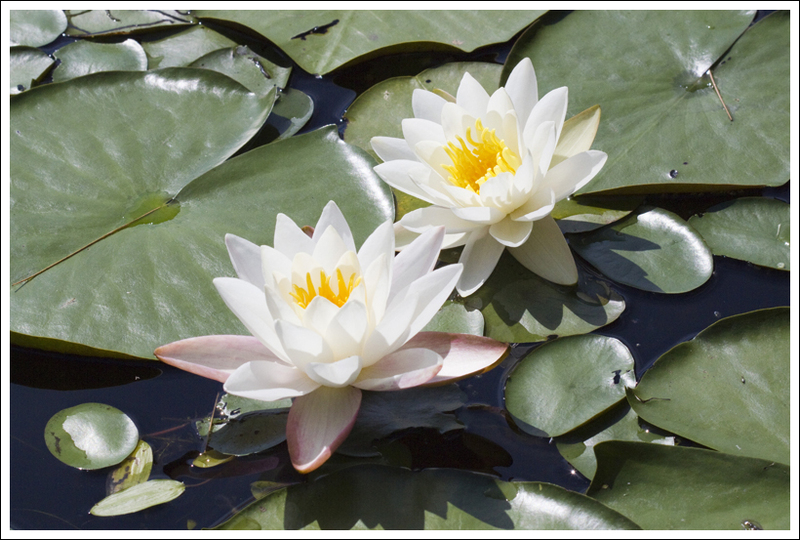 At mile 2.3, you will reach Post #4, bearing right and seeing views of the small Halfmoon Pond. At mile 3.4, you will reach Post #6, going under a bridge and close access to the Eagle Lake parking lot. Most people start their bike ride here, so expect lots of people around this bridge. After going through the bridge, you will arrive at Post #9 at mile 3.5. The trail goes along the western side of Eagle Lake, but goes up during one of the tougher sections of this loop ascending over 200 feet. At mile 5.5, you will come to Post #8. Take a break if you would like here, for the toughest part of the first section is over. At Post #8, take a right (this is where I failed to follow the map closely which caused us to retrace our steps and made us go uphill). At mile 5.7, you will reach Post #10. Take a left at this junction to make your way. The trail does ascend slightly. 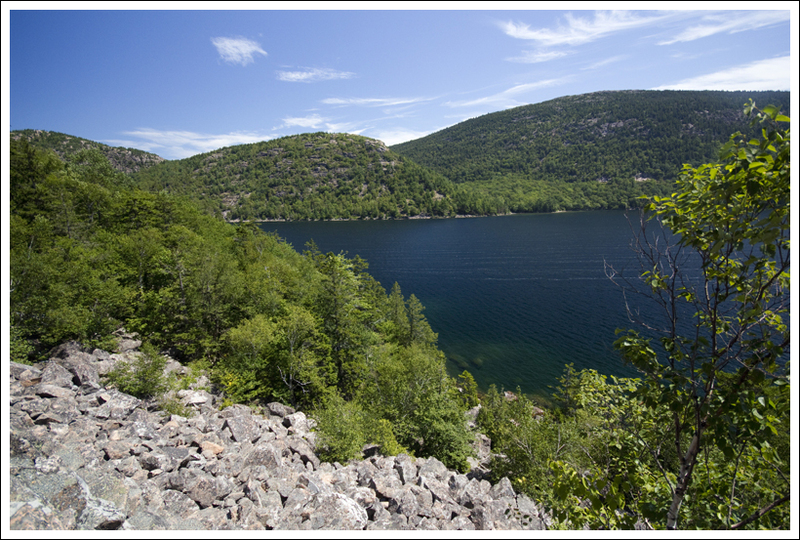 At mile 7.0, the trail begins to open up to views of Jordan Pond and the Bubbles to your left. At mile 7.9, you reach the Jordan Pond House and Post #14. Bear left at this intersection for about .3 mile passing by Post #15 and Post #16. 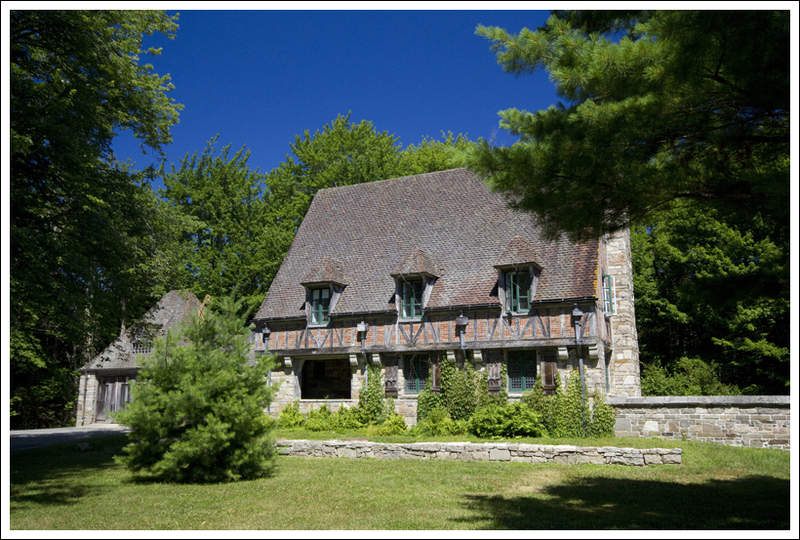 Cross the Park Loop Road carefully and then you will see the large Jordan Pond Gatehouse. Bike carefully through the gate. At mile 9.8, you reach Post #17, near Wildwood Stables. Take a left here and your climb begins again. Once the trail levels out, you will pass by Bubble Pond on your right. At mile 12.9, you reach Post #7. Take a right at this junction and you will begin to enjoy the best views of Eagle Lake. The trail continues along the eastern side of Eagle Lake. At mile 15.1, you will reach Post #6 again. Take a right and go under the bridge. At mile 16.2, you will reach Post #4. Take a right here and at mile 17.3, you will reach Post #5 to complete your loop. As there are a lot of intersections, I would recommend picking up a map of the trails. While you can purchase them from many places in Bar Harbor or Acadia National Park, they do have some decent carriage road maps that are free. These are typically in some of the boxes attached to the post intersections near some of the entrances to the carriage roads. I did spot these boxes at Post #5 and Post #8. 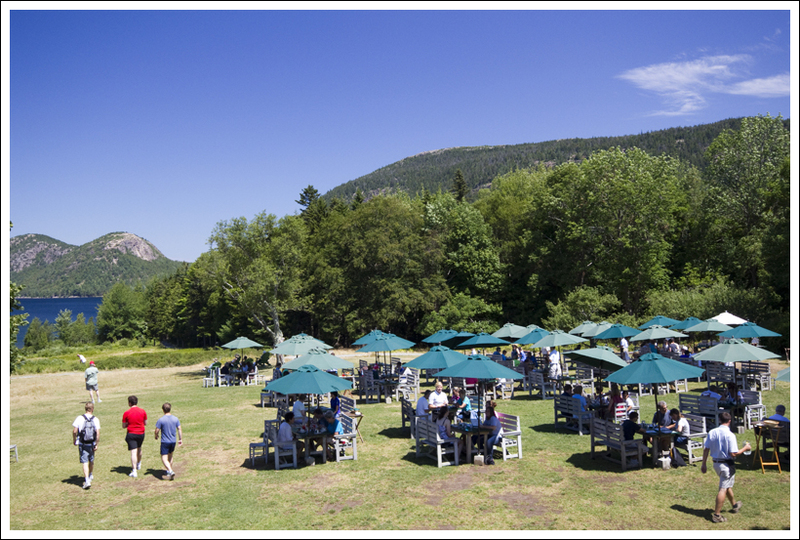 Lunch on the lawn at Jordan Pond is not to be missed. Below: Views of Jordan Pond and the Bubbles. If you do your planning well, you can include a stop near the halfway point at the Jordan Pond House Restaurant. This is a must-visit restaurant while in Acadia. 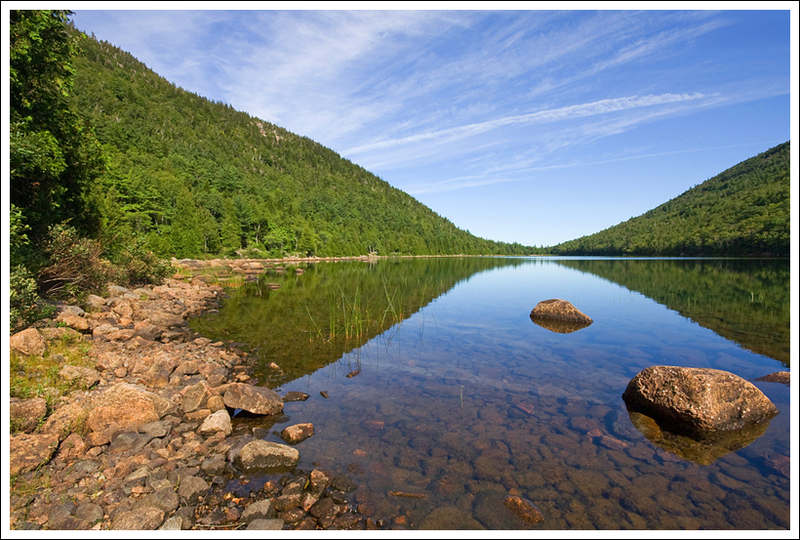 Get a seat outside and enjoy popovers as you take in the scenes of Jordan Pond and the Bubbles. The menu has been expanded since the last time we had been here, so we were thrilled to try some new things. Christine really enjoys their lobster quiche and I like their cranberry walnut chicken salad sandwich. While the prices are a little high, you do have one of the best views for a restaurant. There are plenty of places nearby to lock your bike and there is a gift shop that sells everything from hiking gear to pottery to Gatorade. They even sell Jordan Pond coffee and popover mix. I have two favorite sections of scenery along this trail – the view near the rock slide approaching Jordan Pond and the eastern side of Eagle Lake. This is a bike ride that almost invites you to take your time by soaking in the great views of the lake, taking your time to pick wild blueberries near Witch Hole Pond, or listening for the cry of loons on Eagle Lake or Jordan Pond. Biking Acadia’s Carriage Roads is always one of the Maine activities I look forward to most on our trips! It’s funny, when I visited Acadia as a child and teen, I never tried the carriage roads by bike. Instead I preferred to run. Looking back, I don’t know what I was thinking! Sure… the carriage roads are great for walking and running, but I can’t imagine a better way to see them than by bicycle (Unless I was given the option to go on horseback; but unless you arrive at Acadia with your own horse, the closest you can get is taking a chauffeured horse carriage ride.) 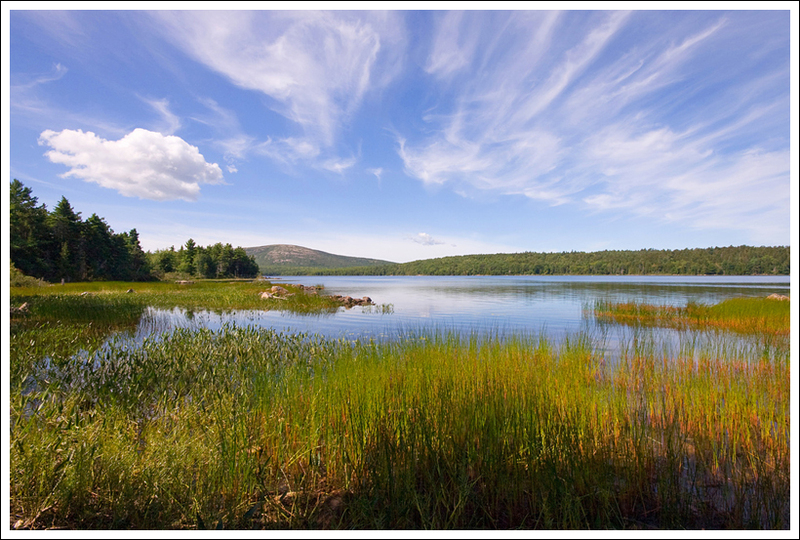 The car-free carriage roads in Acadia meander through the woods, passing ponds and lakes. If you’re lucky, you’ll spot beavers or loons swimming. You get occasional glimpses of the ocean. You breathe in the clean, evergreen-scented air. And best of all… you can bike right up to the Jordan Pond House and indulge in popovers with butter, popovers with strawberry jam, popovers with soup, popovers with salad and even popovers a la mode! Don’t even get me started on how much I love popovers a la mode. They’re one of my raison d’êtres. I’m not even kidding – ask Adam! Sometimes we bring our bikes on the long drive up to Maine, but this time we drove our small car to save gas money, and ended up renting bikes at the Bar Harbor Bicycle Shop. The folks there are really friendly and knowledgeable and their bikes are all expertly maintained. We tried renting a carrier for our car, but none of them worked with our particular hatchback. Thankfully, my parents were vacationing with us and were able to haul our bikes to the start point of our ride. Technically, you can ride your bike from the shop to the carriage road entrance, but it’s an arduous uphill ride along a very busy road. Biking the few extra miles from the shop to the trails takes a lot of the enjoyment out of the ride, so we avoid it any way we can. On this particular day, we decided to follow one of our absolute favorite routes. Starting at Duck Brook Bridge, we biked around Witch Hole, then around Eagle Lake, past the north shore of Jordan Pond to the Jordan Pond House. After lunch, we continued the route past Wildwood Stables, along Bubble Pond and the opposite shore of Eagle Lake. A few final miles along the other side of Witch Hole returned us to our car. Even though the Gatehouse sits in the park, it’s still privately owned. 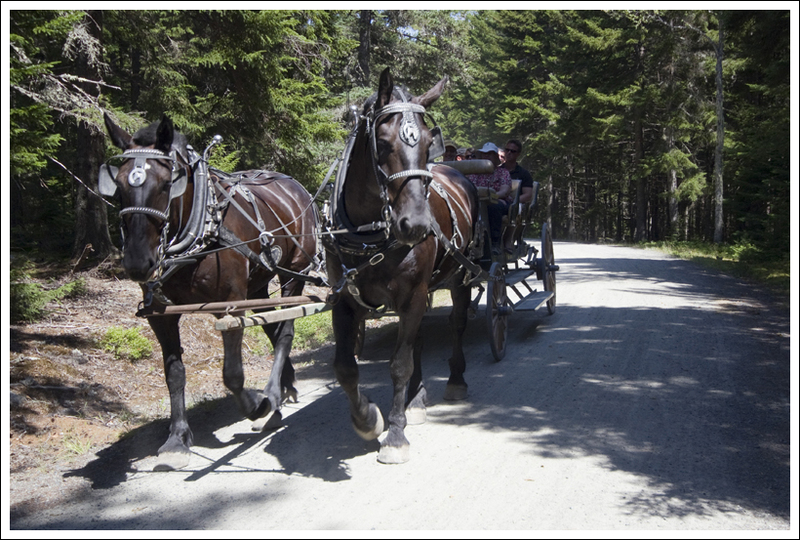 Below: A horse carriage on its way from Wildwood Stables to Jordan Pond. The trail marker at the far end of Eagle Lake is one of the only places that directions get confusing along the ride. The trail branches off in several different directions at this point. As (bad) luck would have it, we biked following our instinctive directions instead of looking at our detailed map. We ended up going the wrong way for almost two miles – mostly along a steep, beautiful downhill coaster of a descent. This meant we had a tough uphill slog once we finally realized we were going the wrong way. I suppose we could have kept on going in the wrong direction – most of the trails eventually cross one another and we would have ultimately arrived at the Jordan Pond House. However, I really enjoy the ride along the north shore of the pond, so we decided to retrace our ride. My parents decided to stay the course (my mom didn’t want to bike back uphill) and meet us at the Pond House. The uphill turned out to be less painful than I imagined and after about 15 minutes, we were coasting downhill along the edge of Jordan Pond. I enjoyed the sparkling water, the first glimpse of the Bubbles, passing the big rock slide and knowing I’d soon be eating popovers. The ride along Jordan Pond goes really quickly. At Jordan Pond, the first thing we always do is get our name on the waiting list for a table on the lawn. If you visit the Pond House, you can almost always get an indoor table immediately, but you DO NOT want to do that. The best place to sit is outside on the lawn at one of the picnic tables overlooking the water and the Bubbles. I always start my meal off with lemonade. It’s fresh-squeezed and comes unsweetened with a tiny pitcher of simple syrup, so you can sweeten the drink to your personal taste. The regular lemonade is good, but the strawberry lemonade, loaded with fresh strawberry puree, is even better. As soon as you finish placing your order, a waiter will come around with a basket of piping hot popovers. They’re served with butter and homemade strawberry preserves. On this particular day, I ordered the lobster quiche, which has always been a favorite of mine. I also couldn’t refuse a second popover, even though it cost a little extra. Because we were biking and I didn’t want to feel over-full, I had to pass on the a la mode (for now). After lunch, we refilled water bottles and took a few minutes to digest lunch while browsing the Acadia gift shop. We also stopped to chat with the Friends of Acadia who were working on fundraising and recruiting new members. We joined a few years ago and are happy to support our favorite National Park. After leaving the Jordan Pond House, we crossed the Park Loop Road and passed by the privately owned gate house. We happened to time our departure perfectly to pass a team of draft horses pulling a buckboard up the hill. They’re such huge and beautiful creatures! The ride along this section is wooded and doesn’t pass anything remarkable. You can take a side road to get down to Wildwood Stables and Day Mountain, but we continued on toward Bubble Pond. Bubble Pond is a gorgeous spot. We’ve seen loons there and I’ve even taken a photo of the pond that was featured on the cover of Boston Magazine’s 2011 Summer Travel issue. This year, the view was as lovely as ever, but the experience was marred by a couple changing the diaper of their caterwauling toddler. They had the child laid out on a rock on the pond’s edge… the edge of the pond that is a source of public drinking water. Ewww! I know babies need changing, but for God’s sake… take the diaper-changing activities off the trail and away from the water source. After passing the end of Bubble Pond, you go over a neat arched bridge, cross the Park Loop Road again and make the final push back toward the opposite shore of Eagle Lake. As the trail gets closer to the lake side, you get some really lovely lake and mountain views. You also pass one of the most popular kayak launch spots in the park. Shortly after passing the launch, you arrive at the Eagle Lake parking area. This area is another parking option for accessing the Carriage Roads, but it’s usually horrible congested. We continued past this spot to bike the remainder of the trail along Witch Hole and back to our car. Witch Hole is very pretty – full of lily pads and beaver dams. It was a fantastic ride – one that I know I’ll want to do again and again! After we wrapped up the ride, we headed back to the hotel to get cleaned up before dinner. Sometime between the end of the ride and leaving for dinner a heavy fog rolled over the island. It’s really amazing how quickly clear blue skies can turn to thick, cottony fog in Maine! It’s part of the island’s charm, I suppose! We enjoyed the foggy evening at one of our favorite lobster pounds, Thurston’s (in Bernard). If you’re on MDI and want a classic Maine lobster experience, don’t miss Thurston’s! Distance – 17.3 miles. We added about another 4.4 miles due to our misdirection. Elevation Change – Approximately 500 feet. Difficulty – 2. There are some uphill sections which will have you switching to lower gears, but it is doable for most people. Take breaks whenever you need one or walk your bike up the steeper sections. Trail Conditions – 4.5. The only thing better is pavement. The carriage roads have small crushed gravel, which is good for just about any type of bike. I would recommend a hybrid or mountain bike though due to the gravel. Views – 3.5. Most of the views are of the lakes, so you can’t see for miles and miles in most parts, but the lakes and ponds are gorgeous. Waterfalls/Streams – 4. You get great views of Witch Hole Pond, Eagle Lake, Jordan Pond, and Bubble Pond. Wildlife – 1. You may see an occasional loon or gull in the lakes, but not much else other than a red squirrel. Ease to Navigate – 3. There are lots of turns on this trail, but bring a map and follow the signposts and you should do well. Solitude – 0. This is an extremely popular spot for bikers, walkers, runners, and even horses. 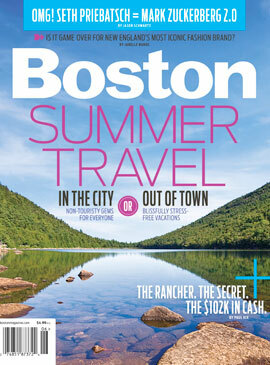 Directions to trailhead: Head west on 233 out of Bar Harbor. After about a mile outside of town, take a right on Duck Brook Road. Travel for about two miles until you reach the roadside parking near the park service building. I read somewhere that going clockwise around the lake is easier. Would this be true or not much different? We’ve gone both ways and find it about the same. This looks fantastic! Thanks for sharing. 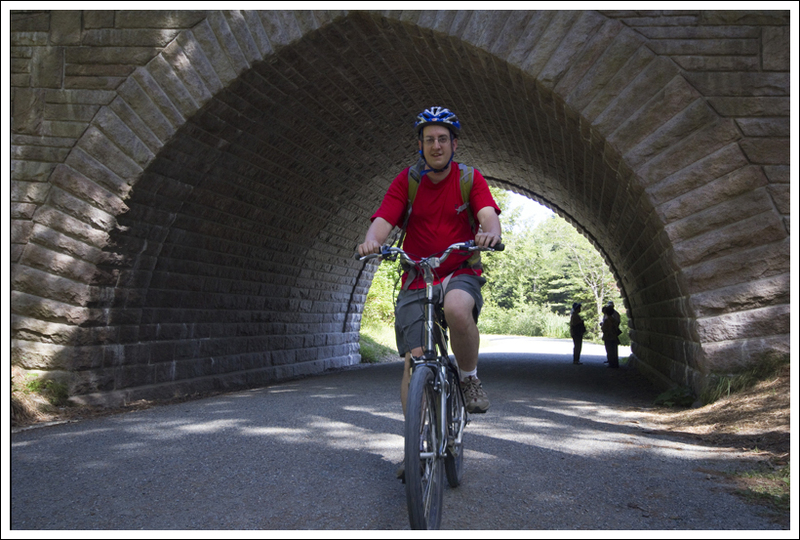 How many hours did you spend biking the 17 miles of trails? Sounds like it was a full day. It probably took about three hours. Just did Eagle Lake and Jordan Pond- you’re right, a map is very helpful! Thanks for the great write up. Hi – I’d love to know what type of camera you use?